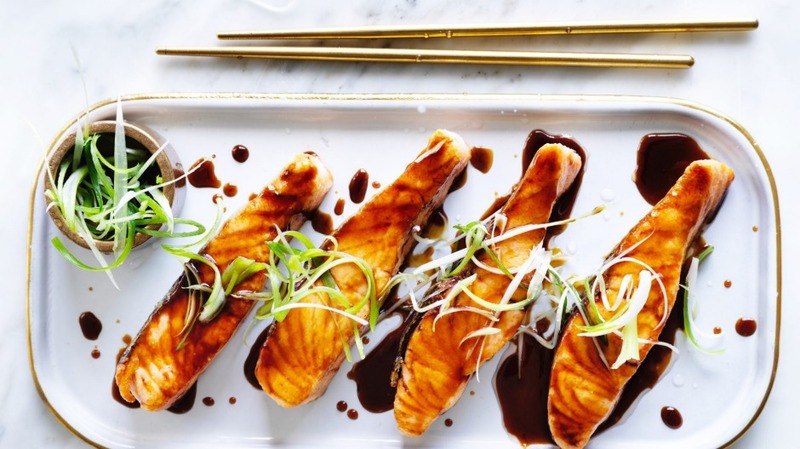 Teriyaki salmon is a dish well worth your attention. It can be whipped up in minutes and is likely to become a family staple. It certainly is in my house. Cut the salmon fillets lengthways into three equal portions and dust lightly with cornflour. Heat a medium frying pan over medium heat and add the oil. Fry the salmon pieces for about 1 to 2 minutes on each side, and using tongs, hold the salmon upright pressing the skin onto the pan for about 30 seconds for each piece to crisp it. Transfer the salmon to a plate. Add the soy sauce, mirin, sake and sugar to the pan and stir well to dissolve the sugar. Simmer until the mixture has thickened to the consistency of maple syrup. Turn off the heat and return the salmon to the pan, turning it to coat it in the glaze. Transfer to a serving plate and pour over any remaining glaze. Scatter with the spring onions and serve. Adam's tip: You don't need to waste your time marinating ingredients for teriyaki. The entire point of it is that it's a glaze on the outside of the food. In Japanese, teri means "shiny", and yaki means "grilled".